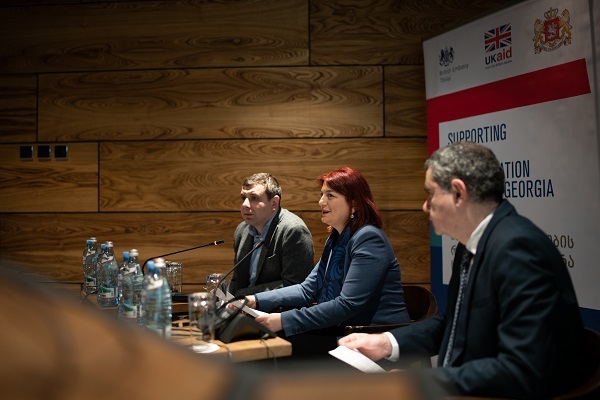 The event was organized by the Institute for Development of Freedom of Information (IDFI) in partnership with the Civil Service Bureau of Georgia and with the support from the United Nations Development Program (UNDP) and UK aid from the UK Government. The discussion concluded that educational institutions are crucially important for the professional development of civil servants. In 2015-2017, more than 55,000 civil servants were trained through more than 500 training programmes. 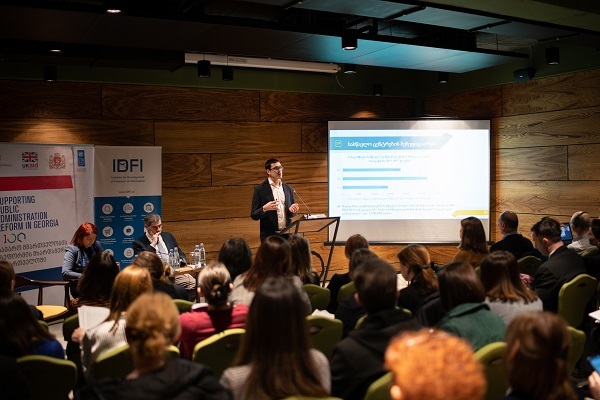 Saba Buadze, Head of the Anti-Corruption Direction at IDFI, presented some key findings of a research conducted in 2018 to examine different factors that affect a system of professional development of civil servants, such as the capacities and experience of the state and private educational institutions, existing legislative framework in Georgia and the situation in the ministries. “Training centres are providing services that vary by their scale and quality. Our research showed the need to allocate more resources to ensure that professional development of civil servants is regular and sustainable ,” – Saba Buadze said. According to Ekaterine Kardava, Head of the Civil Service Bureau of Georgia, the study results are in line with the vision of the Civil Service Bureau, as well as with the training system of civil servants regulated by the new Law on Civil Service and its Subordinate Act. “Findings and recommendations of the research are offering interesting opportunities to improve professional development of Georgian civil servants,” she said. Gigi Bregadze, UNDP Democratic Governance Team Leader in Georgia, stressed that professional and capable civil service is critical for the success of the ongoing reforms, including the systemic changes in public administration and local governance. Nino Begiashvili from the National Center for Educational Quality Enhancement,reviewed the new legal provisions that regulates the accreditation of the training programmes for public servants aiming to establish a uniform standard. The participants of the meeting also discussed new developments and opportunities in civil servants’ training. Eter Chachanidze of GIZ and international expert, Karim Mejadi, reviewed the shortcomings of the training system in Georgia and, based on international experience, suggested the ways of improvement. The research of the training system of civil servants in Georgia is part of a wider programme to support the public administration reform in Georgia. With the budget of GBP 4.5 million from the British Government, the initiative is implemented by UNDP in cooperation with the Georgian Government.